Janice and I sat in silence in the little motorhome. She was at the dinette, I was sitting on the couch. We both looked around at the amazing little camper that seemed to have everything two people might need. The kitchen featured a microwave/convection oven, sink, and 3 burner propane stove. It had a refrigerator that worked on either electricity or propane and was big enough to travel for a couple weeks without needing to restock. The comfortable couch folded into a double bed and there was another loft bed over the driver’s compartment. More importantly, after 15 years of tent camping and using public restrooms and showers, it had it’s own clean bathroom complete with separate shower. As the body ages, one appreciates having a bathroom near at hand in the middle of the night. The whole thing sat in a compact little 23 foot box on a Mercedes Benz diesel chassis. In addition to the home-like interior the little motorhome had all the features of it’s larger brethren including a built in generator, air conditioner, furnace, holding tanks for waste and freshwater, an entertainment system, and enough storage for the carrying of reasonable cargo. It was February 2007 and we were at the Valley Forge RV show. We had decided to come to the show at the last minute to “look” at campers. Previously we had owned a boat and tent camped regularly on just about any body of water where we could launch the boat. But interest in boating had waned and we had sold the boat and the tent collected dust in the barn. When I was 25 I didn’t mind spending considerable time in a tent, but the idea of being in a warm, dry camper (or cool camper on a summer day) was very appealing. It turns out Janice and I had vastly different ideas of what our new camper should be like. We had agreed on a hard-sided travel trailer. Despite having sold the boat, I still owned a powerful Chevrolet Tahoe with substantial towing ability. But my idea of a travel trailer and her’s were not similar. I found myself browsing, the short, ultralights while Janice was drawn to much larger units, some featuring grand picture windows with his and hers recliners. I had visions of trying to back a 30 foot monstrosity into a tree-lined State Park campsite at 10:00 on a Friday night. A shudder ran down my spine. This seemed to be Janice’s idea of a travel trailer. I particularly liked a smaller 19 foot job with fold out ends similar to a pop up. We had ruled out pop-ups because if it rains it is still soaking wet and one has to set it up again at home to dry it out. Plus if the campground is noisy, a pop-up is no quieter than a tent. Essentially, it is just a lot of money to get you up off the ground. Unfortunately, I had to admit Janice was right when she pointed out that my favorite little trailer wouldn’t be much different than a pop-up in that it still needed to be dried out after a wet trip and certainly wouldn’t be noise blocking. We were not doing well finding something we both liked. I was also having a bit of minor heart failure over the prices. Pete’s idea of a travel trailer. Then we stumbled into the little Itasca Navion. We hadn’t discussed motorhomes and if I was having sticker shock from the trailers the little Mercedes-based motorhome made me positively comatose. But it was pretty awesome. The more we sat inside the more we realized how perfect it was. Without me voicing my thoughts Janice said “This is a really great little camper”. As we left the show that day, Janice stopped me and said “Should we go back and buy that?” Now, my wife doesn’t order a new blouse without thinking about it for a couple weeks so this was pretty extreme and for once I was the one to say “Absolutely not”. I hadn’t done an iota of research on motorhomes in general and these little sprinter-based things in particular. I mean, it was great and all but heck no I wasn’t ready to drop that sort of coin without a bit more thought. As is usual, I should have just listened to my wife. After much research and back and forth with the dealer and a test drive we ultimately bought the show model RV. Lil’ Nav, as he came to be known, came home in late February 2007 and spent the rest of the cold, snowy winter in our driveway. I spent cold winter nights studying the owners manuals. Weeks passed and finally in late March, a beautiful Saturday arrived. Janice had to work Saturday morning but as the weather warmed, I began to learn about the water system of our little RV. I had the anti-freeze drained and the water system sanitized in no time. I had also flipped on the refrigerator early that morning. Lil’ Nav and I were ready to camp so when Janice came home we threw some clothes and food on board and drove the fifteen minutes to French Creek State Park. It wasn’t far but it is a pretty park and a great spot for our shakedown cruise. We arrived late in the afternoon, found a free spot, backed in, extended our slide out, and plugged in the 30 amp power cord. That was it. Camp was set up. We were used to a couple hours of wrestling with tent poles, canvas, hauling boxes of gear, and setting up a picnic shelter. This little effort seemed strange and we stared at each other as if to say “Now what”? We spent the rest of the weekend learning and exploring the systems in our little coach. The star of the weekend was the propane furnace. It was still early in the year and it was cold. In addition to the built in furnace, we had purchased a little ceramic heater. This would prove to be almost entirely adequate for most heating needs and could keep the living space warm by itself. It was much quieter than the furnace. If I was unsure how I would like camping in a motorhome instead of a tent, the question was answered Sunday morning. It so happened the weekend was the Pennsylvania trout opener. French Creek State Park boasts two lakes, one of which gets stocked. We were surrounded by tent camping anglers. The morning was raw and cold. The temperatures struggled to reach 40. I sat in my pajamas at the dinette drinking coffee with the little ceramic heater purring away. I watched out the window as the parka-clad trout fisherman emerged from their tents and struggled with frozen fingers to build giant campfires to warm up. They looked cold. I turned the thermostat on the ceramic heater up a notch, sipped hot coffee, looked around and thought “This isn’t so bad. Not so bad at all”. 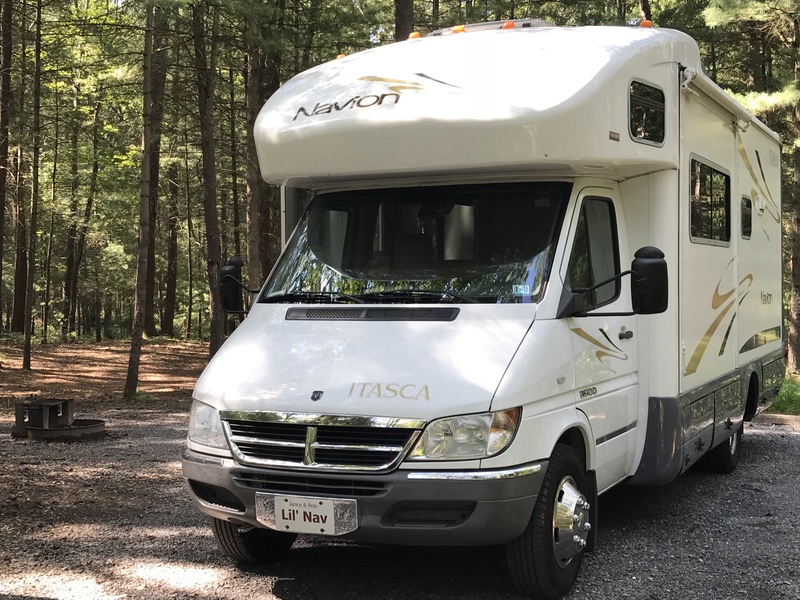 Since that first weekend we have made countless trips in our Navion including weekends, longer vacations, and even day trips. There is something to be said for traveling with your own clean bathroom and kitchen. We have been as far North as Maine, and as far south as North Carolina. One year we traveled to Iowa for Winnebago’s Grand National Rally. (Itasca is a Winnebago brand.) I expected that to be a week of bean bag baseball but it turned out to be a fantastic trip where we learned a lot and made some great friends. I’d suggest that anyone that owns a Winnie product and has never been to carve out the time to go. It is well worth it. We were there . . Somewhere. Between now and then there have been many more adventures. I learned to back quickly and accurately when descending a mountain road from a hidden winery. We came around a bend to discover a John Deere with a hay rake coming up the road. A quarter mile of reverse ensued. Janice drove in all the worst spots: The Washington beltway at rush hour, and the construction zone in the pouring rain outside of Chicago. I slept through both of these. Lil’ Nav was along when I completed my first half-ironman, volunteered and signed up for Ironman Lake Placid and served as base camp for many other races. I got some pretty envious looks when emerging from my coach freshly showered and changed moments after crossing the finish line. In addition to racing, and wine hopping, Lil’ Nav has taken us fishing and hunting too. By now you might be asking “So why farewell”? Fair question. We have loved our little coach but at the same time it is our first motorhome and has been a learning experience. Every motorhome, like every car, boat, or house, is a series of compromises. Well, maybe not Oprah’s house. She probably has everything she wants. Probably not many compromises here. There is a longer list of things I would change if we were keeping our little coach. In fact, we almost did. But between things like refinishing the exterior, and the suspension upgrades to make it ride better among other age related repairs, cost was getting to the point that it didn’t seem reasonable. Plus no amount of money would solve the items on the list above. (I’m quietly writing this in the dark while my spouse sleeps a mere three feet to my left on the fold-out couch). After years of research and a summer of shopping, we landed on a new Class A coach. It is, by RV standards, an entry level coach which is fine with me. The industry seems to have over-complicated the non-entry level variety with State-of-the-Art additions that aren’t always better than the tried and true technology that goes into entry level stuff. Plus for us appearance is a big part of the package. Some of the newer Navions tick a lot of the boxes but Winnebago has changed to new styles of interiors that we just don’t care for. Despite how much I like a floor plan, if my wife says “Yuck” when we walk in the door we can just move on to the next one. (And this is all subjective. Everyone has different tastes. I have a lot of friends who are very happy with the new materials.) The new coach we have picked out has great choices in interior and exterior colors. The point is, this weekend is our last little rendezvous with Lil’ Nav. Our reliable little coach will get a new owner and sometime in the next couple weeks we will take delivery of our, as of yet un-named, Georgetown GT3. I am not one to get emotionally attached to objects, but admit I am a bit melancholy about our last trip. Janice and I have had great fun in this little coach and we will miss it. We hope to have many great adventures in the new one. Our last campsite with Lil’ Nav. Farewell my friend! Previous It Ain’t Over ‘Til It’s Over! How exciting. We always camped when I was growing up and I always thought it would be so fun to ride along in an RV. Happy new adventures!